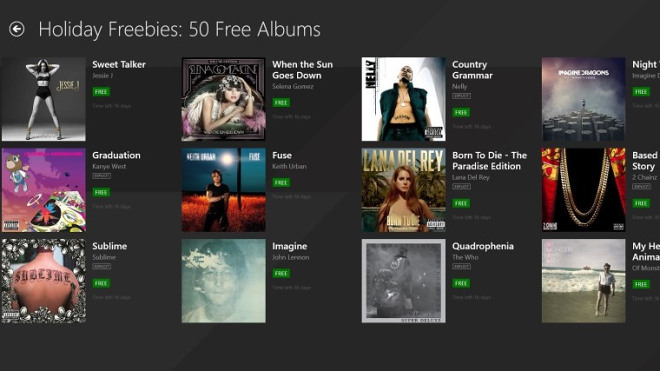 If you are using Microsoft’s Xbox Music streaming service, you can now download 100 popular albums for free. Microsoft is giving those away those albums to citizens in the USA only (damn licensing rights! ), who are subscribers to its music app with Xbox Music Pass activated. Some of the free albums include TRON: Legacy OST, Swedish House Mafia – Until Now, U2 – All That You Can’t Leave Behind, Eminem – The Marshall Mathers LP2, Zedd – Clarity, Avicii – True, Lana Del Ray – Born to Die, Jessie J – Sweet Talker, Lil Wayne – Tha Carter III and Imagine Dragons – Night Visions. The Xbox Music app is available across all major platforms – Windows, Windows Phone, Apple iOS, Google Play and via a web interface. The 100 free albums will be available for a very short period of time – until December 15, so if you want some of those, you should probably hurry up.